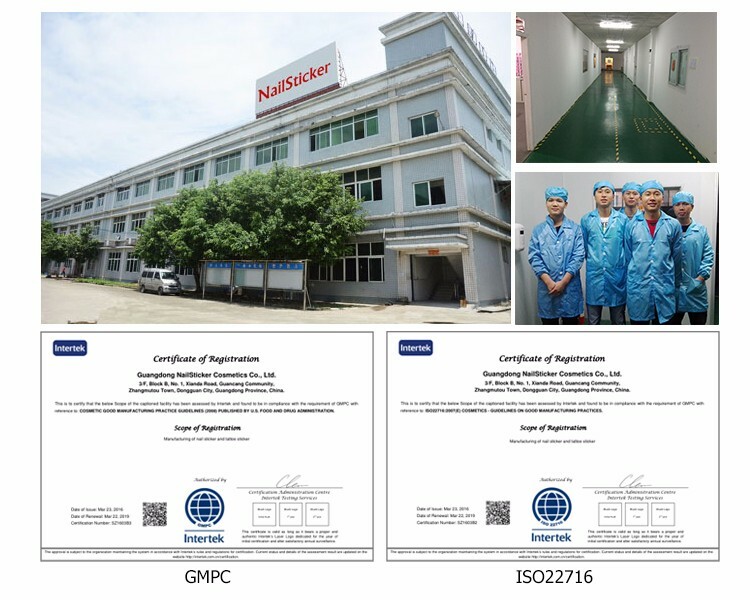 We are GMPC and ISO22716 certified factory. Established in 2002, Guangdong NailSticker Cosmetics Co., Ltd is a professional nail beauty products manufacturer specializing in designing, manufacturing, and distributing full range of decorative/cosmetics stickers such as Nail Stickers, Temporary Tattoos, RhinestoneStickers, Manicure Tools, Holiday/Promotional Gift Sets, Make-up and Bath Products, andFashion Accessories. NailSticker maintains convenient transportation access with 2-hour-drive to both Guangzhou and HongHong and owns one factory(1000 m²) in Dongguan City and one sub-company (Tintark International Co.,LTD) in HongKong. Also, we have two oversea offices in California, US and London, UK. Moreover, NailSticker updates the technologies rapidly and experts in providing design service for clients, especially for the distributors and wholesalers. Retailers are also welcome to contact NailSticker because we always keep competitive products in stock.